It might be pleasant to think that cocoa is as nutritious as an egg, but I doubt that claim would stand up to much scrutiny (and what exactly is “nutriment matter”?). The complete advertisement is shown below. 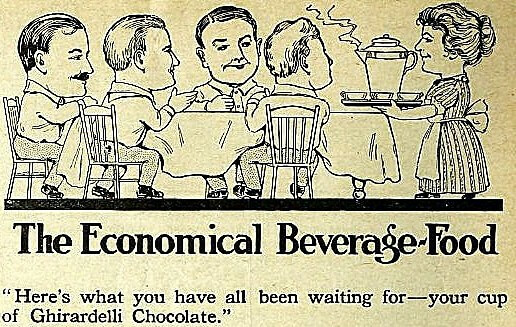 Some of the men in the drawing are recurring characters in Ghirardelli advertisements across multiple publications — one is named Fred, another named John. Two examples are Fred in a Ghirardelli advertisement in the January 1, 1916 Utah Farmer and John in a Ghirardelli advertisement in the October 1915 issue of Better Fruit. 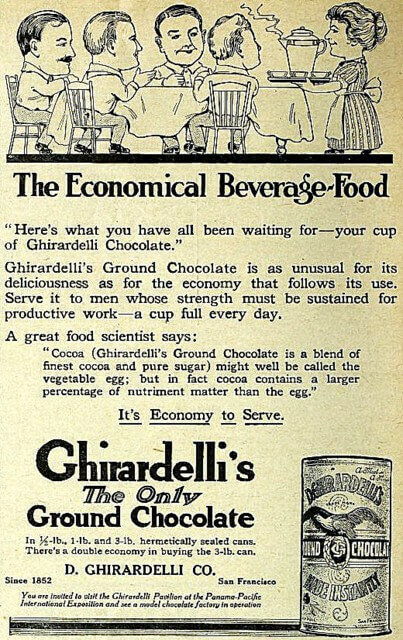 Some of the advertisements have a somewhat unusual style, leading off with “John” or “Fred” in huge letters, and then the pitch about why Ghirardelli is so great. It’s an attention getting approach in a magazine with tiny text, that’s for sure. Advertisement in The Utah Farmer, November 20, 1915 (page 10), from the Internet Archive, via the Internet Archive Book Images’s Flickr Commons collection. Public domain.